The March NAHB/Wells Fargo Housing Market Index dropped two points to 53 from February, the third consecutive monthly decline in the index. While softening during the winter months, the index has remained above 50 since July 2014. Furthermore, of the three components to the index, the expectations for future sales remained steady at 59 (from the downwardly revised February of 59). The HMI decline was primarily driven by a decline in builders’ judgment of current sales where the index fell three points from 61 to 58. While a reading of 58 is well above the tipping point of 50 where more builders rate the market as good rather than poor, it is the lowest reading in that component since June 2014. 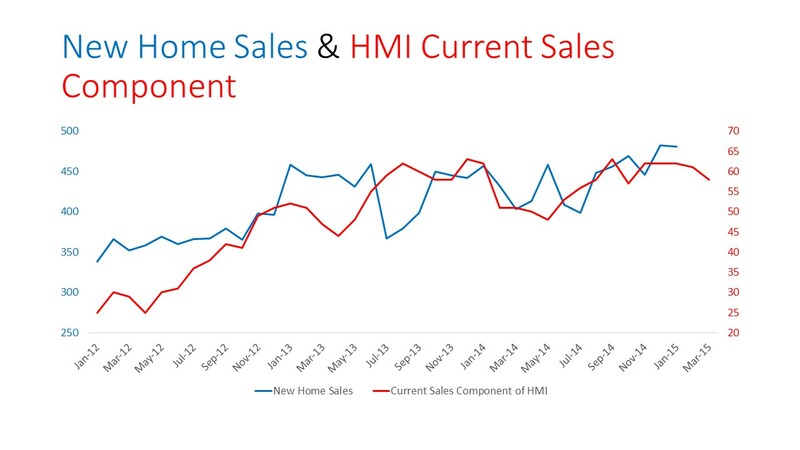 New home sales up through January have been moving up. Builders continue to face challenges finding labor and lots. Lot prices are rising and making it more difficult to remain within buyers’ expectations for the final new home price. Adding labor also means forcing up wage rates while potential buyers remain very price sensitive. Appraisals have also hindered sales particularly at lower price points where supply cost increases have the greatest impact on the final price. A number of comments in this month’s survey mentioned buyers’ desire for bargaining in the face of rising home prices. Regional changes were in both directions. The three month moving average was down in the Northeast, South and West two, two and seven points respectively but up two points in the Midwest. Monthly regional indicators, often more erratic, were up 13 points in the Midwest but down seven points in the Northeast, two points in the South and 11 points in the West. The more dramatic declines in the Northeast and West align with the larger negative changes in existing home sales in January.